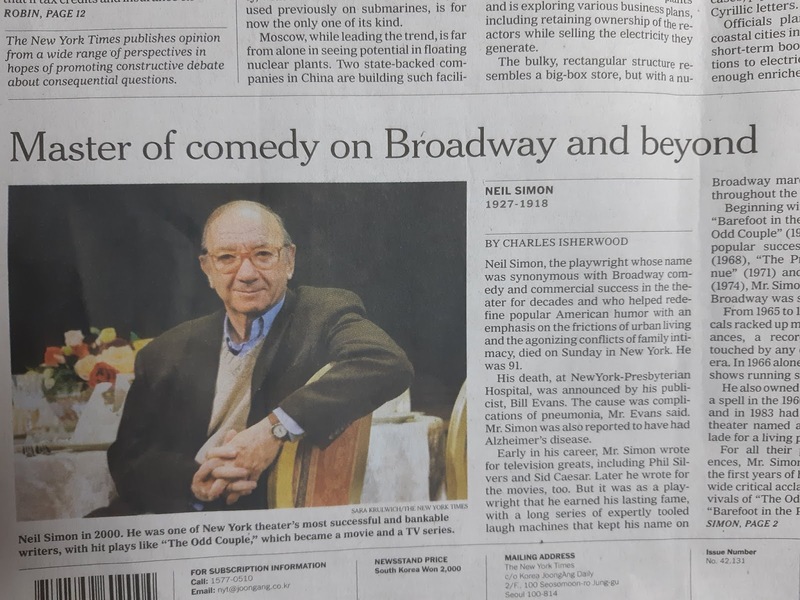 My wife took this photo of the NYT's lower left-hand quarter section, which gives Neil Simon's birth and death dates as 1927 and 1918, respectively, of which the latter figure would appear to be possibly wrong, but who am I to argue with the NYT? To argue or not to argue. That is the question . . . Shouldn't one express some skepticism at a report that a man passed away about nine years before he was born, especially if that same man is shown in fine fettle in an accompanying photo dating to the year 2000, when he would already have been dead for about eighty-two years? There must be some error here, but I can't quite figure out what it is . 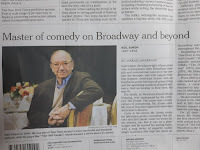 . .
Was Neil Simon related to Benjamin Button? Anonymous, is that link safe?